Good morning fellow Jalops, today begins the start of the final testing session for Formula 1. Will RedBull finally get their acts together and put in some good times? 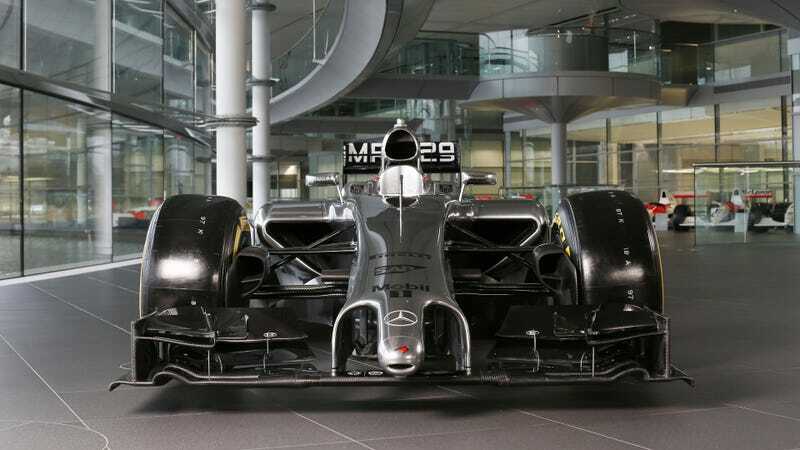 Will the boys from McLaren and Mercedes go even faster? We're about to find out. Like the last few sessions I will start off with the time sheets so far today. Update 1:RedBull's Ricciardo has managed to keep the RB10 going for more than a few laps totaling so far today more than 32 laps. Update 2:Earlier the E22 Lotus had caused a Red Flag and had to be towed back to the pits. Update 4: Red Flag back out on track as the Torro Rosso of Kvyat has not made it back to the pits. Update 5: The mobile crane is out on track picking up the stranded Torro Rosso outside of Turn 2. The team is running a Renault engine, but during this test they have managed to complete 55 laps which suggests that Renault might have made significant progress with all of their cars. Update 6: And the Green Flag drops and we are back under way. At present only Magnussen and Chilton are out on the track. Update 7: Every Jalops favorite party busting Finn is now also on the track after a long abscense, Raikkonen so far today has only managed 12laps. Update 8: Speaking of the Ferrari, Raikkonen pulls a personal best so far with a 1:38.7, and the other Ferrari powered team Marussia sets their own personal best with a 1:39.7. A full second off of their counterparts for Marussia, and many seconds off of the leading cars for Raikkonen. Update 9: According to the BBC's chief petrolhead Andrew, the Renault powered cars haven't been able to do a full race start in fear of damaging the engines, however that might have been fixed since word is Lotus are planning on doing a few during this test session. Update 10: Rosberg now going out on track, Mercedes uploaded this picture to their Twitter. Update 11: Bottas is now also on track, Williams is looking strong this year. Update 13: According to Autosport here is Ferrari's explanation of why Kimi had been stuck in the pits for so long, "We found a small problem that needed fixing and required some time, then fitting some new parts simply elapsed the time a bit more." Update 14: Speaking of the Ferrari, Raikkonen is back to the pits for what looks to be a new nose. Update 15: Sauber's Sutil is gearing up to get back on the track according to their Twitter. Update 16: Sutil is out on the track with around 33 laps so far. Update 17:On the talk of number of laps here is the totals so far. Update 18: Sorry about the short delay had to head into work. But for your enjoyment here are the updated lap times, including a certain Finn that is making his way towards the top. Update 19: Ricciardo is supposedly still battling overheating issues and rather than in the car, according to the BBC he is doing some promotional work! Update 20: Kobayashi tries to leave the garages but the car stalls out before making it out of pitlane. Update 21: Earlier today Maldonado's Lotus came to a halt, Lotus just Tweeted "Diagnosis is exhaust issue (one of the new parts for this test) so we're stripping down and investigating further"
Update 22: According to Autosport and the BBC, Infiniti RedBull seems to be encountering problems still based on overheating that the other teams seem to have overcame, including their junior team Torro Rosso. Update 23: Magnussen going back out onto the track. Earlier McLaren Tweeted their driver schedule for this week which will be today obviously Magnussen, tomorrow Button, Saturday Magnussen, and Sunday will be back to Button. Update 24: According to SkySports, Perez practiced a full start and pretty much drifted for quite a ways and then almost shunted it. Update 25: Busy, busy, busy. the only way to described the track. 6 cars out at the moment, Raikkonen, Perez, Bottas, Sutil, Magnussen, and Rosberg. Update 26: Lotus is pulling the plug on today and announced they will be back tomorrow morning. Update 27: With an hour to go, the reigning World Champions are nowhere to be seen, this does not bode well for the team. However, the other Renault teams seem to be overcoming the issues that plagued them in previous tests. Still no word on whether the teams are allowed to run full hp mapping. Update 28: Bottas returns to the pits after completing a few race simulations. Update 29: Kobayashi after stalling twice finally makes it out of the pits. Update 30: Only three cars out on the track at the moment. Kobayashi, Chilton, and Perez. Update 31: According to Autosports Ben Anderson, Renault may have lifted the ban on engine mapping and RedBull's issues are down to their own car design which is failing due to packaging the engine, not the Renault engines. This is unlike Newey to make this grave of a mistake. Update 32: Bottas runs away with a time thats lightning for today with a 1:36.1! William's might be making a comeback. Update 33: Raikkonen moves back up to third in the timings today. Update 34: Bottas and Sutil are the only cars on the track at the moment. Only a half an hour remaining in this first day of testing. Update 35: Bottas makes a quick garage stop and is about to head back out onto the track. Update 36: Perez and Raikkonen are heading back out on to track too. Update 37: Mercedes shares that some problems led them to not run this afternoon in Bahrain but will be back at full strength tomorrow. Update 38: Caterham's Kobayashi only managed to put in 19 laps ending todays test a bit early. Update 39: RedBull managed to sneak back out with only a few minutes left to go in the test. Update 40: With two minutes to go Raikkonen has caused another Red Flag, duplicating his same red flag last session right before the checkered. Update 41: And that's a wrap folks. Here are the final times for today. The first day of the second test session in Bahrain comes to a close. This session continues to see the World Champions struggle and others start to succeed. Chiefly is Perez setting the pace for today. A few issues arose, such as the problems for Lotus, and Caterham. These final test sessions are hugely important for the teams to get their cars and indeed their teams dialed in before the first race. With only a few weeks before the start in Australia the teams really need as much lap time as possible, something a few teams seem to be struggling with. Well I have to get back to my real job and possibly take a nap. See you all tomorrow where I will be continuing to update you all with all the information I can! Also be sure to check out the second installment of Sittin Waitin Wishin!